The redevelopment of the former University of Colorado Health Sciences Center is the kind of project Continuum was built for. In 1924, the University of Colorado School of Medicine opened at 9th Avenue and Colorado Blvd., four miles southeast of downtown Denver. 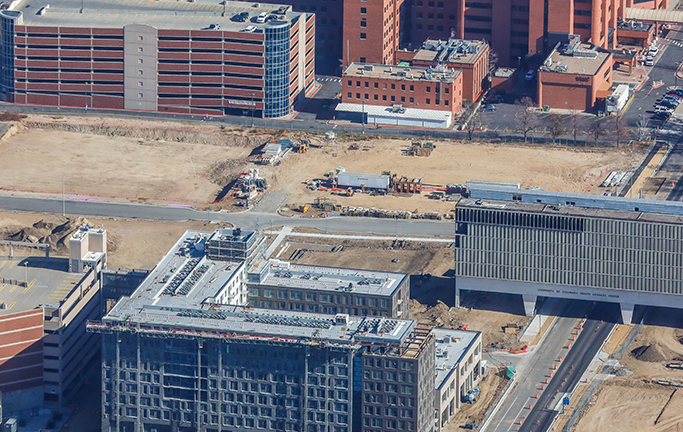 Originally a four-building quadrangle, the center eventually outgrew the mostly residential neighborhood and moved to the Anschutz Medical Campus in Aurora. Scroll down or visit 9thandcolorado.com for more details. 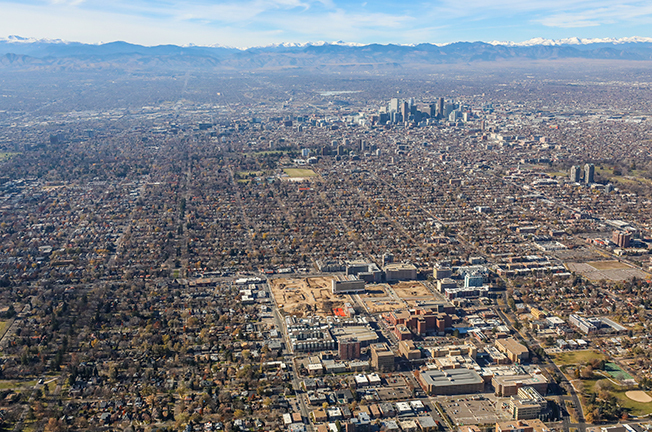 That left this 26-acre site, right in the heart of one of Denver’s historic pre-war neighborhoods, ripe for re-development. The challenge was to find a new plan that met the commercial needs of the area while being sensitive to the history of the site and the residential scale of the adjacent neighborhoods. 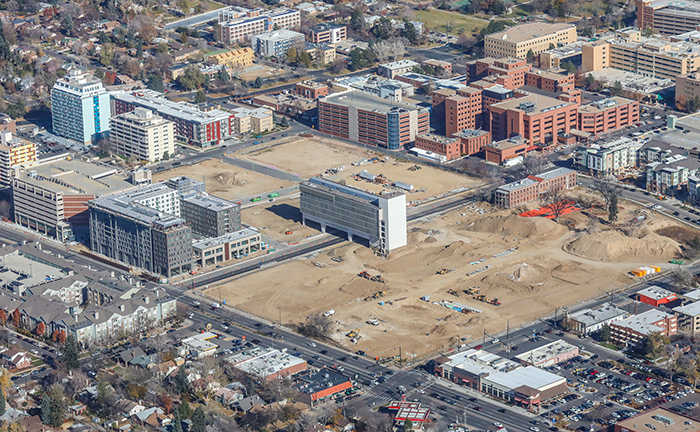 Continuum and its Joint Venture Partner, the CIM Group were selected as the redeveloper in January of 2014 by the University of Colorado and the City of Denver from a long list of proposals. Continuum’s proposal was a progressive plan that aligned with the neighborhood’s Vision Plan. The Vision Plan was written to help guide future development after the neighborhood rallied to defeat a big-box retail plan by a previous developer. The combination of Continuum’s track record and CIM’s deep financial capability made the team the obvious selection for the City and the University. 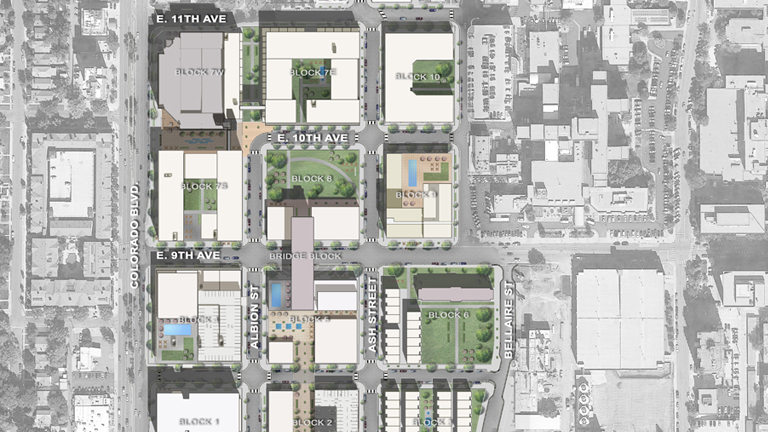 Continuum’s 9th & Colorado plan is designed to reintegrate the 26-acre site into the surrounding neighborhood fabric by blending apartments and townhomes with retail, offices and new public green spaces. A creative mix of both residential and commercial structures, 9th & Colorado promises to become one of Denver’s memorable neighborhood centers. The plan includes the adaptive reuse of some of the iconic buildings within the former health campus, which will help to retain the history of the area. The research bridge, for example, will be converted into a hotel. And the historic nurse’s dormitory will become a 22,000-square-foot specialty retail building. The whole project will be walkable and bike friendly, integrating green space and pedestrian amenities. Overall, the site is projected to see a 40% decrease in automobile traffic from its health campus days. Demolition began in May 2015. 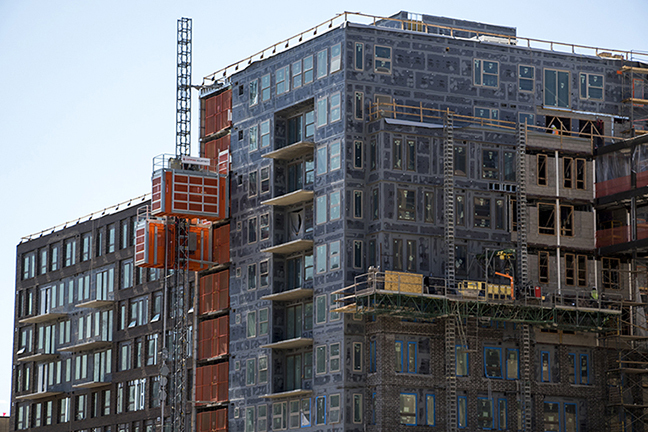 1,100 apartments, condominiums and townhomes. The retail elements of the project will be built around 40-50 shops and restaurants, in a pedestrian-friendly setting. 150,000 square feet of large and small commercial spaces, designed with sustainability in mind. Parks and plazas will integrate green space with public art, a Continuum trademark. Green building, responsible use of resources and a heavy reliance on LEED planning. Jeremy Németh, chair of the planning and design department at the University of Colorado Denver. WEBMAIL ©2015 CONTINUUM PARTNERS LLC. ALL RIGHTS RESERVED. Legal Disclaimer: The information contained herein is subject to change without notice. No representation or warranty of any kind is being made herein or hereby, including any representation or warranty with respect to the accuracy or completeness of the information set forth herein. For example, and without limitation, the renderings of the uses, quantity of uses and/or product types are not intended to, nor do they necessarily, indicate the eventual development of any particular project. Rather, they are intended to illustrate one potential development plan. All marks displayed herein are the property of their respective owners. Materials from this website may not be reproduced or distributed in whole or in part without the express prior written consent of Continuum.